"Rising inequality is highly correlated to unequal access to education. In the United States, 95 percent of those with parents at the highest income levels attend college, while only about 20 percent of the poorest do, research shows." 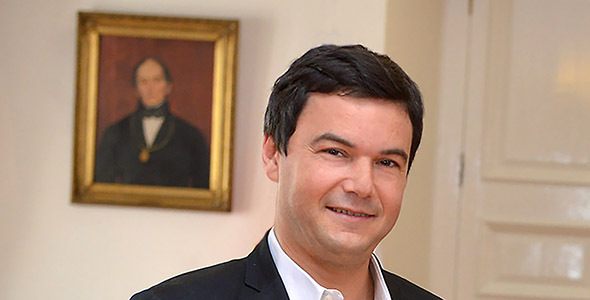 The author of the international best-seller Capital in the Twenty-First Century, Piketty was addressing the 18th World Economic History Congress, an event chaired by MIT Professor of History Anne McCants, who organized the congress, along with local colleagues, under the auspices of the International Economic History Association. Piketty then proceeded to make the following points in a keyote address titled “Rising Inequality and the Changing Structure of Political Conflict." Slides from the address are attached here. Inequality has been on the rise worldwide since 1980. Piketty shared findings from the World Inequality Report that show that while inequality dropped dramatically during the World Wars and the Great Depression, the percent of income going to the top 10 percent of earners has since risen steeply almost everywhere. He noted that the rise has been more dramatic in the United States than in Europe. Rising inequality has not led to rising demand for the redistribution of wealth. Why is that? One possibility Piketty suggested is that globalization, which enables entities to skirt internal redistribution efforts — such as by utilizing tax-free havens — has made the vertical redistribution of wealth within a country more difficult to organize. This trend has meant that one of the few things the modern nation-state can control is its borders, leading to more political conflicts centered on border controls and immigration, he said. Unequal globalization is a choice. Free-trade treaties could be accompanied by redistributive taxation, but that hasn’t been happening. The conclusion Piketty draws is: “Some ruling groups must believe the system is working fine.” He identified two seemingly disparate groups — the “Brahmin left,” comprising highly educated voters who tend to vote for liberals; and the “merchant right,” comprising wealthy individuals who tend to vote for conservatives — and suggested that both see advantages in globalization and rising inequality. This seeming paradox underscores the complexity of the problem of inequality and illustrates the need for additional study of the changing, multi-dimensional structure of political-ideological antecedents of inequality, Piketty argued. Piketty outlined the following key findings at Tuesday’s event. Wealth affects voting patterns more than income. The income profile of left-vs.-right voting has been relatively flat over time. The wealthy, however, are much more likely to vote for conservatives than the poor. From 1956 to 2017, the educated vote moved dramatically from right to left. Today, the more educated you are, the more likely you are to vote for a liberal political party — in France, Britain, or the United States. Rising inequality is highly correlated to unequal access to education. In the United States, 95 percent of those with parents at the highest income levels attend college, while only about 20 percent of the poorest do, research shows. “The rise of higher education is creating a new form of political cleavage,” Piketty said. “The successful look down at those who did not do as well as undeserving.” While the “Brahmin left” want more taxes than do the “merchant right,” they want taxes for “universities and operas,” not wealth redistribution, Piketty argued. In addition to his keynote address at the World Economic History Congress at MIT, Thomas Piketty also gave an interview, in which he discusses challenges for globalization, including the link between rising inequality and political fear-mongering.